Mobile phone forensic	software supports all major brands of Windows based Mobile phones including Nokia, Sony Ericsson, LG, Motorola, Spice, Panasonic, Samsung etc. 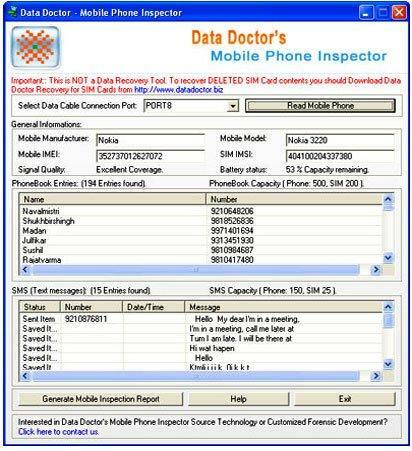 Cell phone inspector software shows all hardware information of your Mobile phone including Mobile signal quality, text messages(SMS) storage capacity, mobile model number, manufacturer name, IMEI number, SIM IMSI number, battery backup status, memory status, phonebook entries etc. Scientific investigation tool provides complete detail of your mobile phone and Sim card memory in html/text file format with inbuilt help manual for easily operated by home and office users. Mobile phone investigator application supports all Windows based Pocket PC including Nokia N-Series, Nokia E-Series, Samsung Blackjack, Blackberry, Panasonic, Hitachi Pocket PC phone, Motorola i930, Sony Ericsson, Anex TEK SP230 etc. Mobile phone inquiry tool supports all your Symbian OS based Nokia mobile phones and other supported phones. Cell Phone inspector utility does not require any special technical knowledge to use this software and provides interactive user friendly graphical user interface (GUI). Cell phone inspector software display hardware details of phonebook numbers and SMS status from both mobile and sim card memory of your Windows based Cell phone. Qweas is providing links to Mobile Phone Inspector Program 2.0.1.5 as a courtesy, and makes no representations regarding Mobile Phone Inspector Program or any other applications or any information related thereto. Any questions, complaints or claims regarding this application Mobile Phone Inspector Program 2.0.1.5 must be directed to the appropriate software vendor. You may click the publisher link of Mobile Phone Inspector Program on the top of this page to get more details about the vendor.